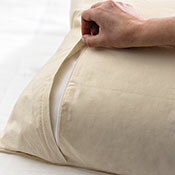 Solus Organic cotton dust mite covers are our top choice for dust mite covers as they represent a high quality product made from the finest 233-thread count organic cotton fabric. Our Solus Organics dust mite covers are GOTS certified organic and have been tested by Porous Materials Inc. to be certified allergen barrier covers with a small mean pore size of 5.3 microns. By encasing your mattress, box spring, pillows and comforter with our Solus Organic cotton dust mite covers you can awake without allergies and be headache-free in the morning. Natural in color with zipper closures. 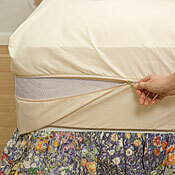 Mattress, pillow and comforter dust mite covers available in a full range of sizes.